Making the change from a fixed position to a freelance one can be daunting. After all, there are a lot of things to consider - your taxes, expenses, where you will find shifts - and the sense of being on your own in the management of your career can spook even the most level-headed of individuals. However, while it may certainly feel frightening in the beginning and the career is not without its challenges, the locum life also has a generous share of perks. From flexible working hours to an ever-changing routine, there is a reason - or rather, lots of reasons - that so many pharmacists decide that the locum life is worth leaving their fixed roles for. When you’re a locum, you get to pick your own shifts - including where they are. If you’re the adventurous sort, you’ll be glad to hear that lots of locums combine their work with travel, picking up shifts in towns and cities they had previously never been to. We spoke with Stephen McGonigle, a Scottish locum pharmacist, who told us that, with his job, he has been able to see more than just his own hometown while working. In fact, Stephen said that he had already explored most of Scotland through different stay away shifts, and has gone as far as England and Ireland. Kufa Artwell, another Locate a Locum pharmacist, told us that he is especially fond of stay away shifts because he is able to experience new areas and environments, and the same can be said of all locum shifts. Like we’ve said before, as a locum, you have the ability to choose your own shifts, and therefore, you don’t have to settle for the same workplace day in day out. You can switch up the scenery as frequently as you would like, whether that is month to month, week to week or even day to day. If you’re the sort of person who is turned off by the rigidity of routine, this might be the perfect way to keep your working life fresh and interesting. The ability to choose when you work is a perk few in the rest of the working world enjoy. Being able to choose your holidays, when you start your day and when you end it, and even the amount of shifts you take on in a month is exceptionally helpful for planning not only your time, but for your family and hobbies beyond the workplace. All of the locums we interviewed said that the flexibility which their locum career provides is one of the best parts of their career. Beyond the locums whom we interviewed, flexibility is still an extremely popular aspect of the locum career. In fact, in a recent study, 77% of locums said that it was the reason that they went locum to begin with. What do you think? 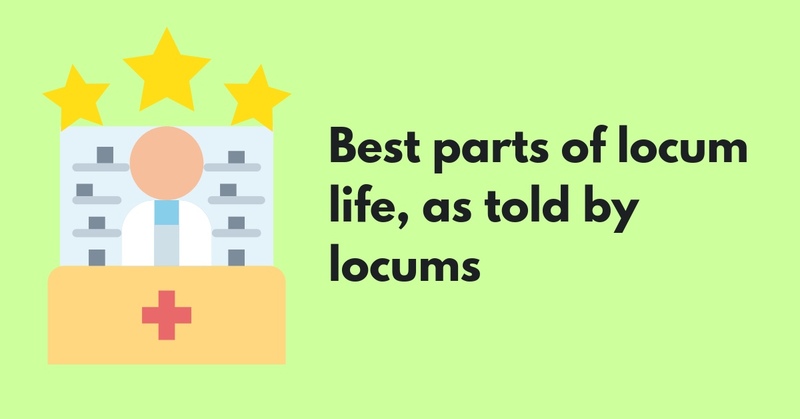 Tell us your favourite parts of the locum life on Twitter, @locatealocum.